When I saw these antiqued brass beads, I immediately thought of the verse in Ezekiel where the prophet is describing the wheels of the Cherubim. I searched and searched for a gemstone “wheel” that would fit inside the larger wheel, and for another “wheel” to fit inside that one. I chose mother of pearl because it had the right luster to match well with the brass, and there was a good contrast of colors and textures between the materials. 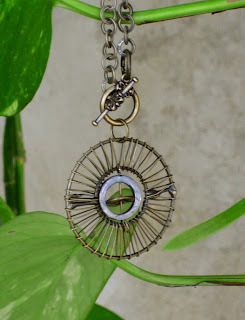 The necklace is 20” long, it has an unusual construction with the toggle in the front, and is crafted of a brass metal chain with circular links to match the pendant. 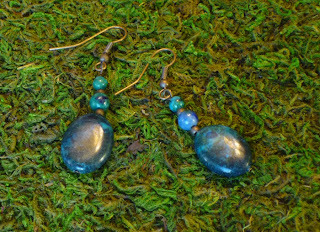 Look for the matching earrings in the earrings section. Today we think of cherubs as cute little roly poly angels with fluffy feathery wings. But the Cherubim described by Ezekiel are in fact, terrifying and magnificent in their glory and power. Remember that, in life’s direst moment, the beings with whom God has surrounded you are incredibly powerful. They are watching over you and protecting you. They are more powerful than any force on earth, more powerful than any servant of the Enemy, more powerful than you can possibly imagine. If the veil were removed and you were to see one, you would probably fall on your face in awe. From Ezekiel Chapter 1, describing the wheels of the Cherubim. “ When the servant of the man of God got up and went out early the next morning, an army with horses and chariots had surrounded the city. "Oh, my lord, what shall we do?" the servant asked. 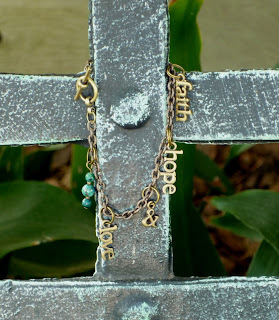 This graceful sterling silver bracelet has three oval charms built into its length: faith, hope, and love. When life is overwhelming you, just look down at your wrist and re-center yourself on the only things in life that will outlast you; the things which really matter: faith, hope, and love. He went on to explain that, unlike the other gifts, faith, hope, and love are abiding gifts, meaning they will outlast all others. When the world is finished and all else fades away, these three will remain: faith, hope and love; and the greatest of these is love. This antiqued brass bracelet has the charms “faith hope & love”, an adorable and secure curlicue hook and loop clasp, and delightful lapis charms. When life is overwhelming you, just look down at your wrist and re-center yourself on the only things in life that will outlast you; the things which really matter: faith, hope, and love. This bracelet is identical to the one listed above except for its clasp. The popular variety of lapis in this bracelet has beautiful inclusions of chrysocolla (copper silicate), a highly prized blue-green gem stone. 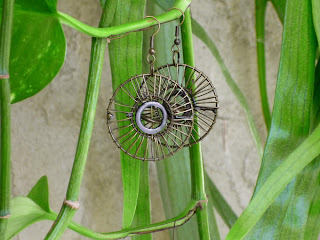 The links and findings are of an antique-look, oxidized brass metal. These brass wire wrapped cages remind me of the tangled web of deceit and darkness which ensnares the hearts of mankind. I envisioned hearts imprisoned within them, blinded by their bonds and utterly unable to escape on their own. 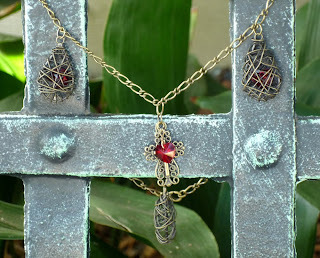 I created the two wire-wrap cage pendants with hearts within them to show how our hearts are bound before we come to the Cross. Then I created a pendant which shows that with Christ, there is freedom. The heart which was formerly enslaved is now set free, thanks to the Cross of Christ. 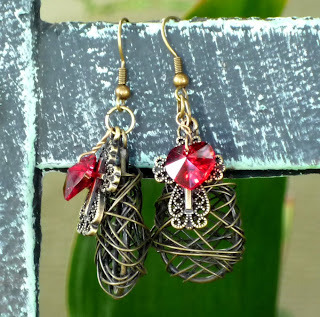 The pendants consist of oxidized brass wire wrapped cages and Swarovski crystal hearts, with a cross on the bottom-most pendant. This is a very, very special design loaded with symbolism and meaning. I hope you enjoy wearing it as much as I enjoyed making it. The key to the treasure. Not treasure as man thinks if it; gold and silver and gems, no. This treasure is laid up in store for you in heaven, where moth and rust cannot destroy it, where thieves do not break in and steal. This treasure spills over into your earthly life in the form of wisdom and knowledge, a sure foundation for your times. And the fear of the Lord, love and reverence for Him, is the very key. Where is your Treasure? 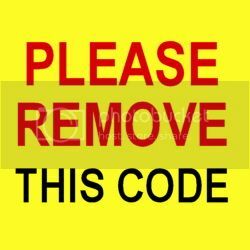 Let this key remind you. 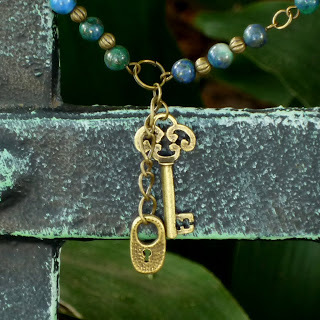 A lock and key, dangle gracefully from this 20" oxidized brass necklace with beautiful lapis and chrysocolla beading. 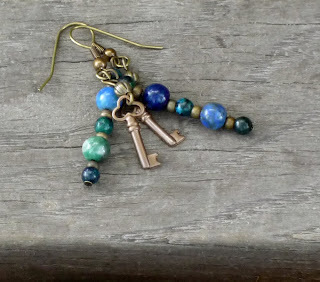 A key dangles gracefully from these lovely oxidized brass earrings with beautiful lapis and chrysocolla beading. Look for the matching necklace in the necklaces section. 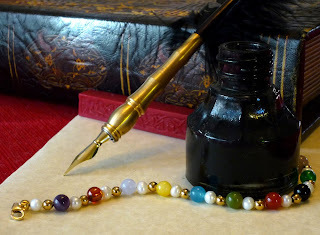 All nine of the fruits of the spirit are listed on this bracelet, in order. Use it to remind yourself of the high goals to which you are aspiring. Give it as a gift to someone special in your life, to thank them for being loving, joyful, peaceful, patient, etc. ... and you will never forget the fruits of the spirit again. 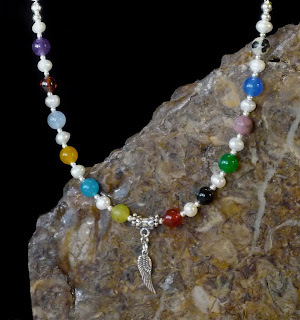 A Holy Spirit dove hangs from this beautiful 24 inch Foundations™ necklace. It is made with genuine sterling silver herringbone chain, beads and findings, while the bead section is strung with strong jeweler's wire. "As Jesus was coming up out of the water, he saw heaven being torn open and the Spirit descending on him like a dove. And a voice came from heaven: 'You are my Son, whom I love; with you I am well pleased.'" 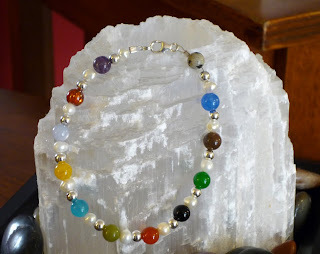 Twelve beautiful handmade gemstone and pearl charms with silver beads dangle from this playful 7 inch Foundations™ bracelet. 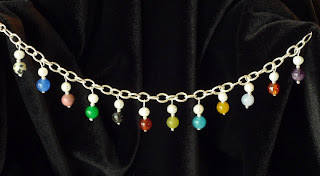 It is made with genuine sterling silver chain, beads and findings. 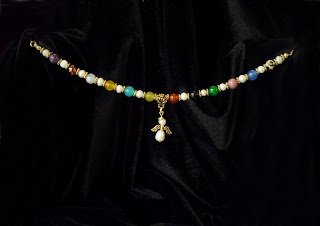 A darling pearl angel graces this beautiful 20 inch Foundations™ necklace. 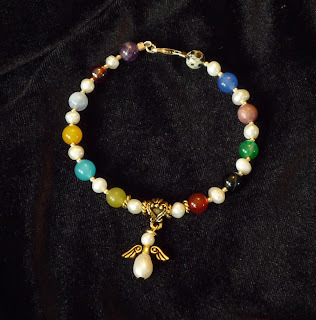 It is made with antique-look 14k gold plated pewter spacer beads, bail, and angel's wings. The bead section is strung with strong jeweler's wire and the chain, clasp and findings are long-lasting gold fill. 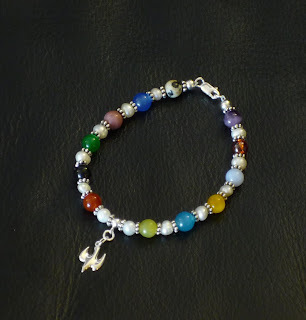 A beautiful Holy Spirit dove charm hangs, dignified, from this lovely 7 inch Foundations™ bracelet. It is made with genuine sterling silver Bali beads and sterling silver findings, and is strung with strong jeweler's wire. More one of a kind jewelry coming soon! I have about six jewelry projects I am currently working on. 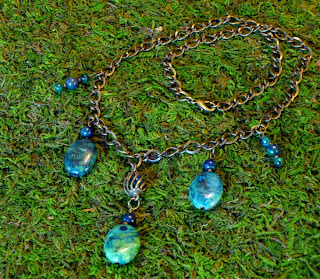 This one-of-a-kind 20 inch necklace is made of very special Venetian glass beads. 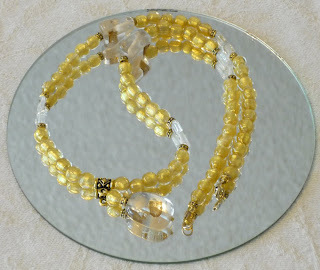 The bore of each clear glass 6mm bead is lined with 22k gold, for a marvelous luminosity. The necklace almost appears to glow from within! "The street of the city was pure gold, as transparent as glass. I did not see a temple in the city, because its temple is the Lord God Almighty and the Lamb. The city has no need of the sun or the moon to shine on it, because the glory of God shines on it, and the Lamb is its lamp." The spacer beads and the pendant bail are an antique-look 14k gold-plated lead-free pewter. The clasp and other findings are gold filled. All Heavenly City™ jewelry comes in an attractive box with a scroll explaining the significance of the piece. Still more listings are coming later tonight, with more coming Thursday and Friday. 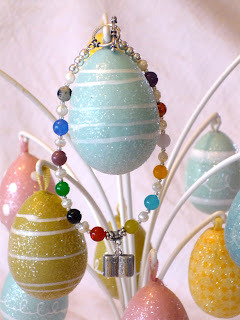 A ddelightful Holy Bible charm hangs, dignified, from this beautiful 20 inch Foundations™ necklace. It is made with genuine sterling silver 2mm beads and findings, while the bead section is strung with strong jeweler's wire. 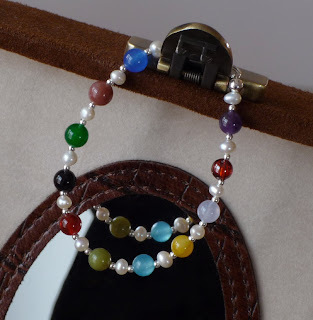 Look for the matching bracelet in the Foundations™ bracelets section! 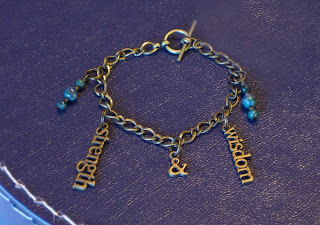 A lovely Holy Bible charm hangs, dignified, from this beautiful 7 1/2 inch Foundations™ bracelet with a toggle clasp. 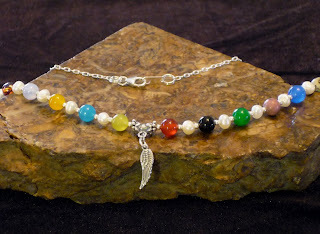 It is made with genuine sterling silver 2mm beads and findings and is strung with strong jeweler's wire. Thanks for looking; I will be uploading more later today. A delicate angel's wing graces this beautiful 20 inch Foundations™ necklace. It is made with genuine sterling silver 2mm beads and findings, while the bead section is strung with strong jeweler's wire. One of a Kind listing: "Clear as Glass"
All of my creations are hand-made, and all of them are unique to one extent or another. However, occasionally I will make a piece that will never be duplicated. This is one of those pieces. "And he took me away in the Spirit to a great and high mountain, and let me see the holy town Jerusalem, coming down out of heaven from God, having the glory of God: and her light was like a stone of great price, a jasper stone, clear as glass... and the city is square, as wide as it is long." 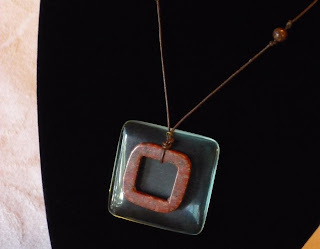 Symbolizing the walls of the Heavenly City, this one-of-a-kind necklace is made of a square frame of jasper situated like a window over a beautiful square of artisan crafted glass. The delicate but strong brown leather cord is accented with matching 6mm jasper beads and the clasp is oxidized brass metal. 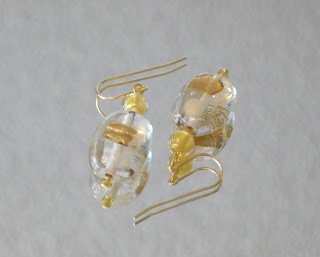 Symbolizing the walls of the Heavenly City, these earrings go with the one-of-a-kind Clear as Glass necklace. 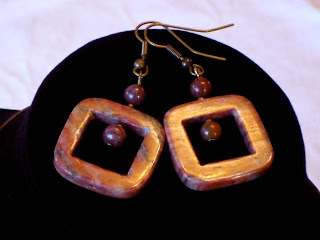 They are made of a square frame of jasper, accented with matching 6mm jasper beads. The findings are oxidized brass metal. Wisdom and strength: two well-known attributes of God. Also character traits people of faith pray for on a regular basis. Now you need only look down at your wrist to re-focus on the Lord, His wisdom & strength, and to remember from Whom your own wisdom and strength come. The popular variety of lapis in this necklace has beautiful inclusions of chrysocolla (copper silicate), a highly prized blue-green gem stone. 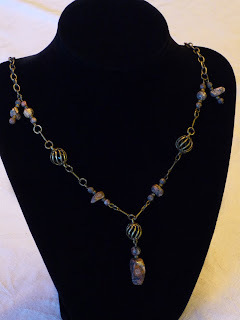 The links and findings are of an antique-look, oxidized brass metal. Tradition says that the Ten Commandments were carved on tablets of sapphire, and it is believed that this and other references to sapphire in the Bible is actually lapis lazuli. "There in heaven was a throne with someone sitting on it. His face gleamed like such precious stones as jasper and carnelian." Jasper is a beautiful stone! It comes in many varieties and can have very different appearance depending on the variety and even the individual stone. 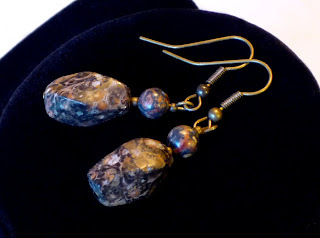 These particular earrings feature a grey and pink mottled stone called leopard jasper. The links and findings are of an antique-look, oxidized brass metal. As always, there are more pieces in the works! Keep coming back to see the latest at Heavenly City. Several New Additions to the Shop! This 7 inch Foundations™ bracelet is made with genuine 14k gold beads (2mm) a genuine 14K gold clasp and 14k gold-filled findings. 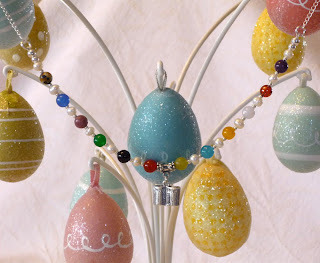 It is strung with strong jeweler's wire. This 7 1/2 inch Foundations™ bracelet is made with genuine sterling silver 2mm beads and findings and is strung with strong jeweler's wire. This 6 3/4 inch Foundations™ bracelet is made with genuine sterling silver 2mm beads and findings and is strung with strong jeweler's wire. This 7 1/2 inch Foundations™ bracelet is made with genuine sterling silver 4mm beads, toggle clasp, and findings, and is strung with strong jeweler's wire. These are just a few of the several I listed. More variety will be coming soon: earrings, necklaces, and other styles of jewelry, too. Keep watching! I have read numerous books on success and fulfillment. They always have a similar theme: focus on what really matters, live with integrity, do what you love, and love what you do. Trust your intuition. Go with those little promptings you get; they are usually right. If you have a sudden revelation about something you ought to be doing, making, selling - DO IT. You will not regret having done so. Three years ago, while reading the Bible, I decided I needed a pick me up. I turned to the last book, Revelation, and looked around for John's description of the glory of heaven. While studying this glorious text, I had a sudden idea. 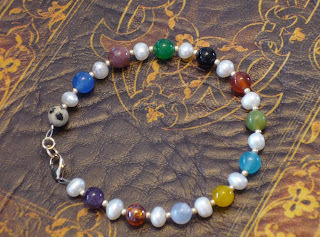 Why not make a bracelet for myself out of all of the stones listed in Revelation 21? I would love to have one. Then I had another idea. 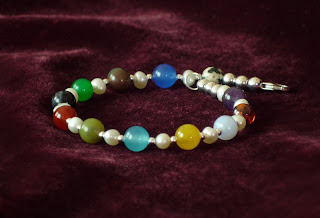 Why not make these bracelets for others? Had anyone done this before? Did such an enterprise already exist? I researched and found nothing. So I made lists of the stones I would need and how much it would cost to get started. I ordered a few strings of beads. I daydreamed about business cards and marketing plans and starting another small business. I instinctively knew I must tell no one; this was a patent-able, trademark-able idea. But then, for some strange reason, I stopped, and the few beads I had ordered sat in a box for three years, waiting. The files I had compiled were lost. Why? Who knows? Maybe I was overwhelmed at the startup cost. The fear of criticism from my friends. The fear of the learning curve involved in a new venture. The fear of having a small business fail. The fear of what might happen if I succeeded. Well, ladies and gentlemen, I fear no more! Or rather, I have an appropriate level of fear to the occasion, but I am no longer allowing fear to govern my decisions. So, without further ado, please allow me to introduce Heavenly City™ Jewelry. Heavenly City™ jewelry is meant to be a way to remember that earth is not your final home. 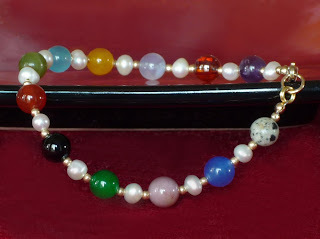 Representing the twelve foundations of the Heavenly City as delineated in the Bible (Revelation 21:19-21), the Foundations bracelet is made of the twelve foundation stones: jasper, sapphire, agate, emerald, onyx, carnelian, chrysolite, beryl, topaz, chrysoprase, jacinth, and amethyst. In between the Foundation stones are twelve pearls (representing the twelve pearly gates) and gold beads (representing the Heavenly streets of gold). 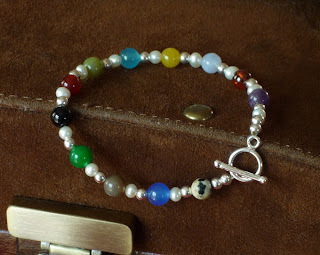 Silver bracelets have sterling silver beads. Heavenly City™ jewelry has a different significance for each person who wears it: to one, the jewelry may be reminder of your own ultimate destiny; to another, a remembrance of a loved one who has gone before; and to still another, a talisman of a sacred hope for your children. Because of this, Heavenly City™ jewelry makes a thoughtful and unique gift; it has deep meaning and significance to both the giver and the recipient. 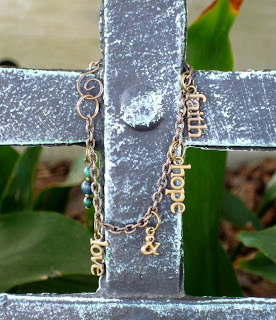 Heavenly City™ jewelry is also an excellent tool for sharing the Gospel and your blessed hope with others. 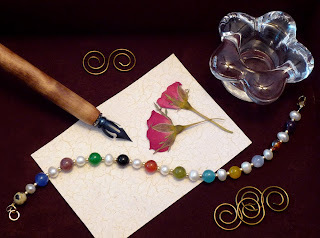 As people compliment you or ask you about your beautiful and unusual jewelry, you can effortlessly ask them if they know where their own eternal destiny lies. After all, you will already be discussing eternity! All Heavenly City™ jewelry comes beautifully packaged with an elegant scroll explaining the significance of each element in the piece. Several years ago I had an epic dream about a young woman who had been changed into a vampire. She was miserable as a vampire, hating herself for it, though she lived in a house full of them. Her entire life was taken up with trying to fit in with the other vampires, though she loathed them and wished to be anything other than what she was. She tried to fight her nature as much as possible, without the others suspecting how she truly felt. Her secret mission, carried out every moment she was away from home, was to find out how to be changed back again. 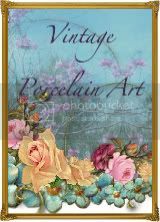 I awoke from that dream saying, "Wow, I should write a book! This needs to be made into a movie!" But of course, I never did anything with it. Life intervened, the dream faded, and I eventually forgot all about it. Right about that same time, a woman named Stepanie Meyer had a dream about a vampire. Afterwards, she wrote a book, Twilight, which was later turned into a movie. Now she is one of the most popular authors alive today and the success of her Twilight series is a teen and young adult phenomenon. I mention this strange dream, and the coincidence of Stephanie Meyer's book, because I have always done this peculiar self-sabotage thing. I have strong urges of intuition and great bursts of creativity, but I ignore them. Or I get right to the brink of success but then somehow I give up, or I allow myself to be derailed by circumstances, or I just fizzle out.